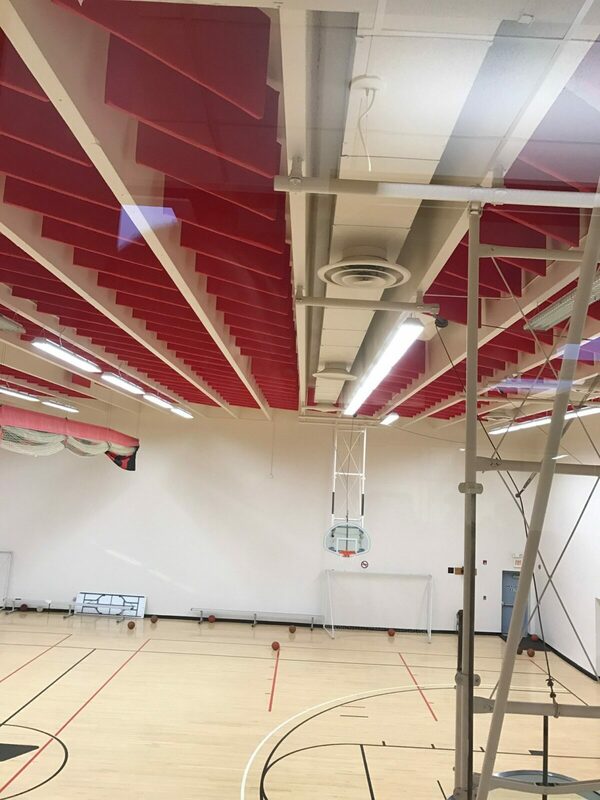 VET Panels are acoustical sound panels cut to a larger dimension than our VET Baffles and designed for vertical suspension against perimeter wall surfaces to help control echo. These hanging all weather sound panels are popular for use in high moisture environments such as Kennels and Natatoriums. VET Panels suspend vertically against the upper portion of the walls around the perimeter of your room, capturing echoes to improve the acoustics within your space. VET Panels are ideal where a VET Baffle ceiling treatment is not feasible, including rooms with low ceilings, rooms with finished ceilings, rooms where lighting might be an issue, and indoor swimming pools with open water that makes baffle placement difficult. Both sound panel options will trigger comparable sound values back so long as the quantities installed are correct. 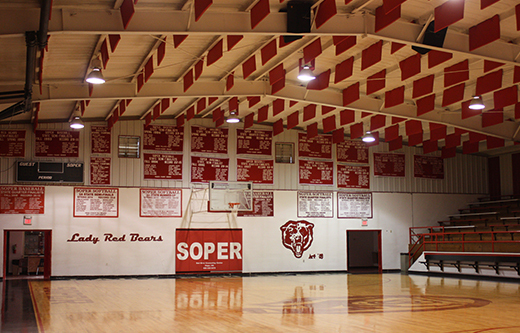 These sound panels are light weight and not dense, they are not designed for use in a gymnasium. VET Panels can be placed up high on the perimeter walls of your room to keep them up and away from potential abuse. Unlike the standard 2’x4’ VET Baffle, these all weather VET Panels can be cut up to 12’ tall. Grommets will be placed into the baffles for ease of installation and portability. The key to the sound values back on your soundproofing project is to ensure that you are not under treating your space. For an accurate count of soundproof wall panels required for your room, be sure to contact our help desk at 1-800-638-9355 or submit a Room Analysis. 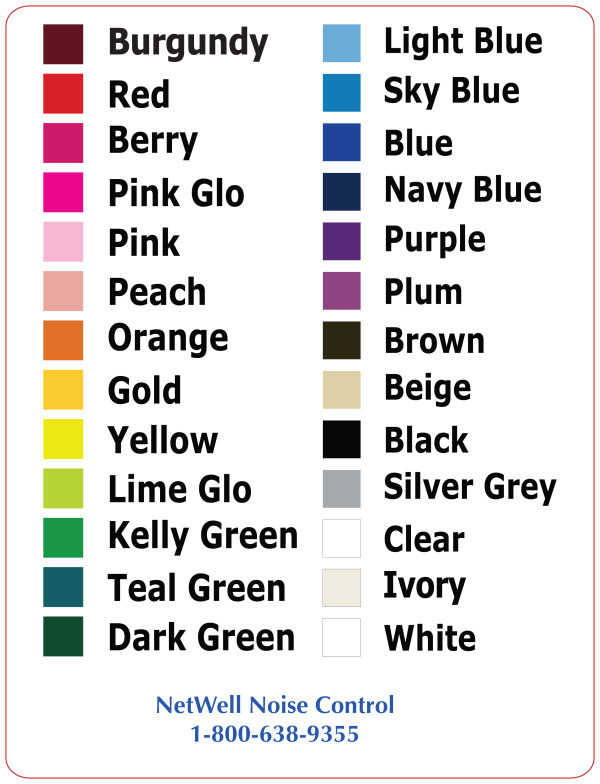 VET Panels are available in 25 colors shown here! VET Panel are available in the sizes listed here. For questions related to your upcoming soundproofing project, contact our help desk at 1-800-638-9355. VET Baffles are the same product cut to a smaller dimension for vertical suspension between exposed joists in your ceiling. 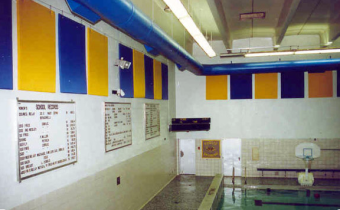 Often times a more popular alternative to the perimeter wall treatment with the VET Panel, unless you have lower ceilings or, as is the case in a Natatorium with open water, it is difficult to install the VET Baffles into the ceiling. Both soundproofing treatments will produce comparable results as the sound panels combine to absorb the unwanted echoes within the space. By lowering the echo, the background noise collapses, crowd noise collapses, clarity returns to original sound, human voice is intelligible, the space is rendered to be more user-friendly. For a variety of ideas on recent soundproofing projects completed by our NetWell clients, we rotate many through our Case Studies library. This is an excellent way to gain perspective on panel choice, placement, color and design. For questions related to your treatment, be sure to contact our help desk at 1-800-638-9355. 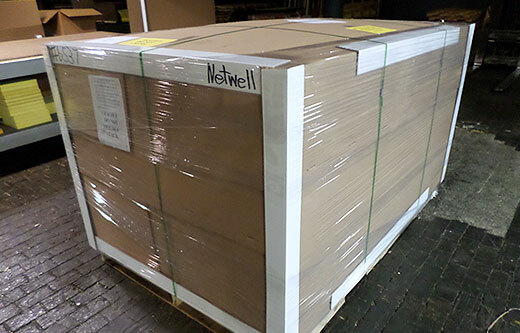 VET Panels are carefully packaged and shipped in boxes that shrink wrap onto pallets and drop ship to your project site. Upon delivery, carefully inspect them to ensure that the full order was delivered in perfect shape and damaged somehow in transit. Be sure to sign for any damage before your driver leaves. For installing the VET Panels, use the grommets that we’ve placed in the panels and free hang them mechanically around the top of your wall space around your room’s perimeter. Our popular Room Analysis is complimentary. This innovative tool is designed to define the framework for your VET Panel treatment and quote your project back. Wall mounted VET Panels will help curb your echoes so long as you place the right amount of product into your room. Submit your room’s dimensions here and we will prescribe your coverage amounts and quote the project back. For questions related to your upcoming treatment, call our help desk at 1-800-638-9355.